This Technical Note will discuss various options to view Email bodies and attachments in relation. 1-Select the field 'IsAttachment'. The result will display which document in the set are email attachments. 2-Apply filter to 'Exclude Attachments'. The result will bring only the original emails; however, you still will be able to check the Email Family Relationships by clicking on the title of a document and from the Document Viewer>Doc Tab review the section listing all the attachments related to the main file (paperclip icon for attachments). >The email body and any attachments. When you click on the title of a document from the Browse or Search pages to open the Document Viewer, you will see under a section called 'Email Family' showing first the email body (envelope icon), and the subsequent documents will be the attachments (paper clip icon). >From the Document Viewer, you can also click on the Original tab to open the native version of documents. When you choose to view the file under the 'Original' tab, it will give you the option to download the emails and open them with a specific application related to the file extension (e.g. Microsoft Outlook). As part of Production creation, Bates numbering is applied to all Responsive Documents part of the Production job. This includes Privileged and Work-Product documents, even though they are withheld from the actual production. 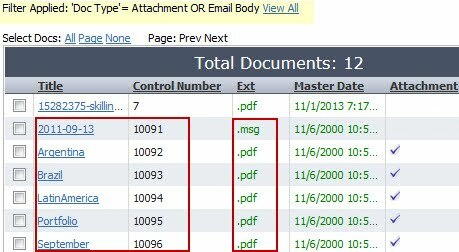 When Bates numbering is applied, emails and their attachments are Bates numbered in order, with the attachments following the email body. Privileged and Work-Product documents are grouped at the end, following Responsive, but non-Privileged/Work–Product documents. Once Bates numbering has been applied as part of a Production, or for documents part of an incoming Production and load-file with Bates numbering applied, emails and attachments are Bates ordered. To email and attachments in order, you can display in Browse, filter as needed, and sort by Bates number. If helpful, you can display the File Extension, which will show MSG for email bodies, and IsAttachment, which will show a check-mark for email attachments.